Having undergone refit works over the winter season 43 metre Emotion² is now even better equipped to offer endless fun on the water. One of her new features is a dedicated golf tee on the sundeck with biodegradable balls and floating golf green. For further fun while at anchor she also has kayaks, stand up paddle boards, a Jetsurf, a Flyboard, waterskis, towables and snorkelling and fishing gear. Emotion² also has an inflatable dock platform to extend the bathing platform for additional space or to act as a launching area. The yacht is a RYA centre for the 2018 season and the First Officer is an instructor. 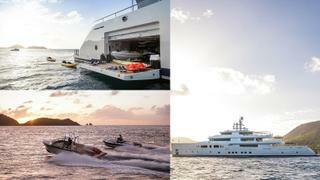 The surprisingly spacious yacht has accommodation for up to ten guests in five cabins. Her full beam master suite located on the main deck has a walk-in dressing room, a private balcony and adjoining office. Other new additions after her most recent refit include an illuminated tiger onyx bar in the upper saloon, a fireplace on the sundeck and a new sauna in the gym. 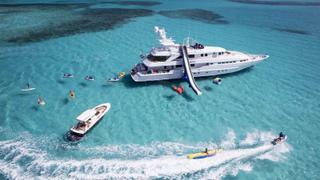 Emotion² is managed for charter by Burgess and has a weekly charter rate starting from €133,000 per week. Having undergone refit works over the winter season 43 metre Emotion² is now even better equipped to offer endless fun on the water. One of her new features is a dedicated golf tee on the sundeck with biodegradable balls and floating golf green. For further fun while at anchor she also has kayaks, stand up paddle boards, a Jetsurf, a Flyboard, waterskis, towables and snorkelling and fishing gear. Emotion² also has an inflatable dock platform to extend the bathing platform for additional space or to act as a launching area. The yacht is a RYA centre for the 2018 season and the First Officer is an instructor. The surprisingly spacious yacht has accommodation for up to ten guests in five cabins. Her full beam master suite located on the main deck has a walk-in dressing room, a private balcony and adjoining office. Other new additions after her most recent refit include an illuminated tiger onyx bar in the upper saloon, a fireplace on the sundeck and a new sauna in the gym. 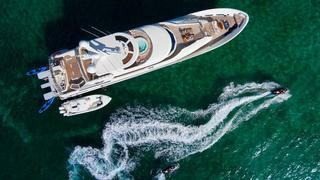 Emotion² is managed for charter by Burgess and has a weekly charter rate starting from €133,000 per week. The 59.1 metre Oceanco Helios, which has recently been sold, has joined Edmiston’s charter fleet and is one of the yachts with the best selection of water toys available for charter. Perfect for fun with all the family, she has a 40-metre custom slide and a large climbing wall. Her toy box also includes three of the latest model Seabobs and a selection of Sea-Doos. Other standout features of Helios include a vast sundeck with a Jacuzzi, a fully equipped gym and a drop-down cinema projector screen for movie nights. She can accommodate up to 12 guests in seven cabins including five doubles and two twins, for ultimate flexibility. 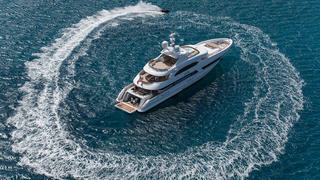 Helios is managed for charter by Edmiston and has a weekly charter rate starting from €350,000 per week. She will be available in the West Mediterranean this summer. The 59.1 metre Oceanco Helios, which has recently been sold, has joined Edmiston’s charter fleet and is one of the yachts with the best selection of water toys available for charter. Perfect for fun with all the family, she has a 40-metre custom slide and a large climbing wall. Her toy box also includes three of the latest model Seabobs and a selection of Sea-Doos. Other standout features of Helios include a vast sundeck with a Jacuzzi, a fully equipped gym and a drop-down cinema projector screen for movie nights. She can accommodate up to 12 guests in seven cabins including five doubles and two twins, for ultimate flexibility. Helios is managed for charter by Edmiston and has a weekly charter rate starting from €350,000 per week. She will be available in the West Mediterranean this summer. Head out into the ocean atop a one- or two-man canoe courtesy of 49.17 metre Nassima, who can be found cruising in the west Mediterranean all year round. Those with a need for speed can take advantage of the Jobe inflatable donut, banana chaser and couch, while thrill seekers can try out the inflatable trampoline or the FlyBoard. Additionally, she has paddleboards, a wakeboard, water skis and two dive sets. Nassima can sleep up to 12 guests in six cabins including a vast owner’s suite with its own private deck. Additionally, she has an elegant saloon with a large television, a formal dining table for 12 people and a fitness room with state of the art gym equipment. Her sundeck has a Jacuzzi, drinks bar and sunpads, and she boasts a choice of al fresco dining areas. Nassima is managed for charter by Fraser and has a weekly rate starting from €200,000. Head out into the ocean atop a one- or two-man canoe courtesy of 49.17 metre Nassima, who can be found cruising in the west Mediterranean all year round. Those with a need for speed can take advantage of the Jobe inflatable donut, banana chaser and couch, while thrill seekers can try out the inflatable trampoline or the FlyBoard. Additionally, she has paddleboards, a wakeboard, water skis and two dive sets. Nassima can sleep up to 12 guests in six cabins including a vast owner’s suite with its own private deck. Additionally, she has an elegant saloon with a large television, a formal dining table for 12 people and a fitness room with state of the art gym equipment. Her sundeck has a Jacuzzi, drinks bar and sunpads, and she boasts a choice of al fresco dining areas. Nassima is managed for charter by Fraser and has a weekly rate starting from €200,000. Step aboard 44.17 metre At Last and slide into the turquoise Caribbean waters via her inflatable slide, which stretches down from the flybridge. Guests can also play on the water trampoline, while the more adventurous types can opt for one of the four wave runners, Seabobs, water skis or paddleboards. Additionally, she has everything needed for days spent diving the stunning coral reefs of the Caribbean. Delivered in 1990 by Heesen and refitted in 2014, she can sleep up to 11 guests in five cabins with a crew of eight. Her on-board highlights include a skylounge bar, a contemporary main saloon and a quirky dining room. Her sundeck boasts a bar, Jacuzzi, seating area and sunpads with optional shades, while al fresco dining can be found aft. An additional seating area, perfect for watching the sunset, can be found forward. Managed for charter by Camper & Nicholsons, she has a weekly rate starting from $135,000. Step aboard 44.17 metre At Last and slide into the turquoise Caribbean waters via her inflatable slide, which stretches down from the flybridge. Guests can also play on the water trampoline, while the more adventurous types can opt for one of the four wave runners, Seabobs, water skis or paddleboards. Additionally, she has everything needed for days spent diving the stunning coral reefs of the Caribbean. Delivered in 1990 by Heesen and refitted in 2014, she can sleep up to 11 guests in five cabins with a crew of eight. Her on-board highlights include a skylounge bar, a contemporary main saloon and a quirky dining room. Her sundeck boasts a bar, Jacuzzi, seating area and sunpads with optional shades, while al fresco dining can be found aft. An additional seating area, perfect for watching the sunset, can be found forward. Managed for charter by Camper & Nicholsons, she has a weekly rate starting from $135,000. Explore hidden bays and coves with Nautilus's (formerly Grace E) three high-end tenders, including the 9.2 metre Cockwells twin jet tender with two 315hp engines. Alternatively, travel with manpower across the ocean waves with a fleet of six kayaks, two paddleboards and numerous inflatables. To pick up a little speed, opt for the waterskis, wakeboards and tows, or even the two SeaBobs, four See-Doos or two Jetsurfs. Delivered in 2014 by Perini Navi, the 73 metre luxury yacht can sleep up to 12 guests in seven elegant cabins with a crew of 20. Her on-board highlights include a wellness deck complete with gymnasium. massage room, steam sauna, dry sauna, cold dip bath and a hydrotherapy bath. her extremely contemporary interior plays host to a myriad of lounge, dining and bar areas. On deck, she boasts pool a Jacuzzi and a counter-current pool, as well as an al fresco cocktail bar and plenty of options for dining under the stars. Managed for charter by Y.CO, she has a weekly winter rate starting from $749,000 in the low season and $805,000 in the high season in the Caribbean and South America. In the summer season, she will be available in the West Mediterranean with a weekly rate starting from €749,000 in the low season and €805,000 in the high season. Explore hidden bays and coves with Nautilus's (formerly Grace E) three high-end tenders, including the 9.2 metre Cockwells twin jet tender with two 315hp engines. Alternatively, travel with manpower across the ocean waves with a fleet of six kayaks, two paddleboards and numerous inflatables. To pick up a little speed, opt for the waterskis, wakeboards and tows, or even the two SeaBobs, four See-Doos or two Jetsurfs. Delivered in 2014 by Perini Navi, the 73 metre luxury yacht can sleep up to 12 guests in seven elegant cabins with a crew of 20. Her on-board highlights include a wellness deck complete with gymnasium. massage room, steam sauna, dry sauna, cold dip bath and a hydrotherapy bath. her extremely contemporary interior plays host to a myriad of lounge, dining and bar areas. On deck, she boasts pool a Jacuzzi and a counter-current pool, as well as an al fresco cocktail bar and plenty of options for dining under the stars. Managed for charter by Y.CO, she has a weekly winter rate starting from $749,000 in the low season and $805,000 in the high season in the Caribbean and South America. In the summer season, she will be available in the West Mediterranean with a weekly rate starting from €749,000 in the low season and €805,000 in the high season. Zip around the Mediterranean atop Force Blue's new Jet Surf or put some distance between yourself and the sea with her fly board. Alternatively, race the two Waverunners against the Jet Ski and see which is the fastest. Force Blue has the perfect toy box for anyone with a need for speed, containing equipment such as water skis, inflatable towables, SeaBobs and wakeboards. Alternatively, head beneath the waves with some snorkel gear or go for a paddle in one of her two single kayaks. Delivered in 2002 by Royal Denship and refitted in 2009, 63.3 metre Force Blue can accommodate up to 12 guests in six cabins, with a crew of up to 21 people. Her bright and roomy interior boasts a vast saloon for socialising, a movie theatre, amazing spa and gym facilities and a disco room, making her the perfect option for a party. Her sundeck is fully equipped for sun worshipping with a Jacuzzi, seemingly endless loungers, optional shading over the seating areas and observation seating facing forward, so guests can watch the horizon when on the move. Take the party out onto the upper deck aft, where you'll find an expansive cocktail lounge with plenty of seating areas. Force Blue is managed for charter by Fraser and has a weekly charter rate starting from €235,000. Zip around the Mediterranean atop Force Blue's new Jet Surf or put some distance between yourself and the sea with her fly board. Alternatively, race the two Waverunners against the Jet Ski and see which is the fastest. Force Blue has the perfect toy box for anyone with a need for speed, containing equipment such as water skis, inflatable towables, SeaBobs and wakeboards. Alternatively, head beneath the waves with some snorkel gear or go for a paddle in one of her two single kayaks. Delivered in 2002 by Royal Denship and refitted in 2009, 63.3 metre Force Blue can accommodate up to 12 guests in six cabins, with a crew of up to 21 people. Her bright and roomy interior boasts a vast saloon for socialising, a movie theatre, amazing spa and gym facilities and a disco room, making her the perfect option for a party. Her sundeck is fully equipped for sun worshipping with a Jacuzzi, seemingly endless loungers, optional shading over the seating areas and observation seating facing forward, so guests can watch the horizon when on the move. Take the party out onto the upper deck aft, where you'll find an expansive cocktail lounge with plenty of seating areas. 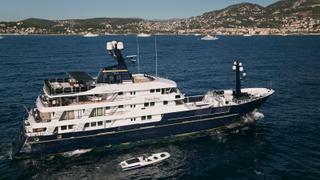 Force Blue is managed for charter by Fraser and has a weekly charter rate starting from €235,000. Don your wetsuit and dive into the Mediterranean with an exciting range of water toys courtesy of 68 metre Triple Seven. Seek out cliff arches and caves atop paddleboards, outrigger canoes and kayaks or pick up some speed with the Waverunners, Jet Skis, Laser sail boats, water skis and flyboards. You could even try a fishing lesson beneath the ocean waves with the diving gear and spearguns. Alternatively, opt for her range of inflatables, which includes a massive slide and climbing wall, to keep the family entertained. Below deck, Triple Seven can sleep up to 10 guests in five cabins with a crew of 18. Delivered by Nobiskrug in 2006, she boasts a clean and contemporary interior complete with private office, a vast main saloon perfect for entertaining, an elegant dining room and a spacious cinema lounge. Guests can relax up on deck in the bubbling Jacuzzi with a glass of Champagne or relax with friends in the aft deck lounge. For dinner next to the ocean waves, head down to the expansive beach club for an al fresco supper. 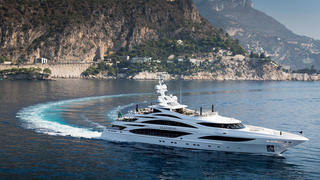 Managed for charter by Burgess, she has a weekly rate starting from €538,000. Don your wetsuit and dive into the Mediterranean with an exciting range of water toys courtesy of 68 metre Triple Seven. Seek out cliff arches and caves atop paddleboards, outrigger canoes and kayaks or pick up some speed with the Waverunners, Jet Skis, Laser sail boats, water skis and flyboards. You could even try a fishing lesson beneath the ocean waves with the diving gear and spearguns. Alternatively, opt for her range of inflatables, which includes a massive slide and climbing wall, to keep the family entertained. Below deck, Triple Seven can sleep up to 10 guests in five cabins with a crew of 18. Delivered by Nobiskrug in 2006, she boasts a clean and contemporary interior complete with private office, a vast main saloon perfect for entertaining, an elegant dining room and a spacious cinema lounge. Guests can relax up on deck in the bubbling Jacuzzi with a glass of Champagne or relax with friends in the aft deck lounge. For dinner next to the ocean waves, head down to the expansive beach club for an al fresco supper. 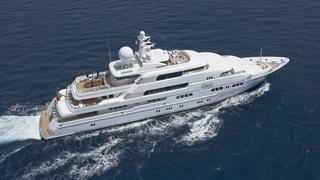 Managed for charter by Burgess, she has a weekly rate starting from €538,000. Explore Central and South America this winter with 83.5 metre Savannah – as one of the world's most expensive yachts for charter,_ _you can guarantee she has a serious selection of water toys. Sailing lovers can make use of the two Lasers, while adrenaline junkies can zip away over the ocean waves on one of four jet skis, four jet surfs, the SeaDoo Wake Waverunner or four SeaBobs. For a more languid excursion, opt for a double or single kayak, a stand-up paddleboard or a towable from her large collection. Keen divers and well catered for thanks to the seven scuba diving sets. Delivered in 2015, Feadship and CG Design pulled out all the stops in order to create a palatial superyacht that covers all bases. Her never-ending deck space boasts a swimming pool, Jacuzzi, lounge area complete with fireplace and a choice al fresco dining spots for any occasion. Highlights of her expansive interior include the spa, complete with masseuse, beautician, gym and Hammam, an underwater observation lounge, exceptional lounge spaces, a private office and library, a sleek dining room and a stunning cocktail bar. She sleeps up to 12 guests in six cabins, which includes a master suite that has a huge skylight and floor-to-ceiling windows. 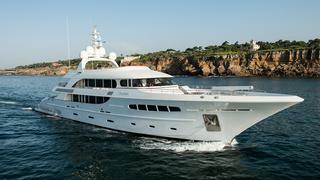 Managed for charter by Edmiston, Savannah has a weekly charter rate starting from €1,000,000. Explore Central and South America this winter with 83.5 metre Savannah – as one of the world's most expensive yachts for charter,_ _you can guarantee she has a serious selection of water toys. Sailing lovers can make use of the two Lasers, while adrenaline junkies can zip away over the ocean waves on one of four jet skis, four jet surfs, the SeaDoo Wake Waverunner or four SeaBobs. For a more languid excursion, opt for a double or single kayak, a stand-up paddleboard or a towable from her large collection. Keen divers and well catered for thanks to the seven scuba diving sets. Delivered in 2015, Feadship and CG Design pulled out all the stops in order to create a palatial superyacht that covers all bases. Her never-ending deck space boasts a swimming pool, Jacuzzi, lounge area complete with fireplace and a choice al fresco dining spots for any occasion. Highlights of her expansive interior include the spa, complete with masseuse, beautician, gym and Hammam, an underwater observation lounge, exceptional lounge spaces, a private office and library, a sleek dining room and a stunning cocktail bar. She sleeps up to 12 guests in six cabins, which includes a master suite that has a huge skylight and floor-to-ceiling windows. 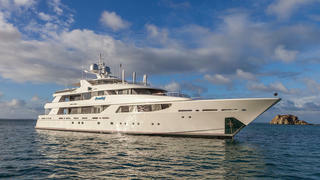 Managed for charter by Edmiston, Savannah has a weekly charter rate starting from €1,000,000. Feed your inner thrill-seeker with a range of exhilarating water toys and towable inflatables offering endless entertainment as part of Bella Vita's (formerly Northern Star) stellar toy box. The 75.4 metre superyacht, which was delivered by Lürssen in 2009, boasts three Seabobs and two jet skis, as well as four kayaks (three one-person and one double) and three paddleboards for those who enjoy a slower pace on the water. Guests can also try their hand at wakeboarding or waterskiing, or explore the marine life below with a range of scuba diving and snorkelling equipment. Perfect for water babies, Bella Vita has two on-deck Jacuzzis for those in need of a dip, both of which are surrounded by sofas and loungers for relaxing in the sunshine. Inside, her recently refitted interior features a large main saloon with a grand piano and adjoining dining room, a beauty salon and massage room, an elegant skylounge with a bar and fireplace, a home cinema and a gym. She has accommodation for 12 guests in six cabins, including a stunning master suite complete with study, his and hers bathrooms and private bar. Bella Vita is managed for charter by Moran Yacht & Ship and has a weekly charter rate starting from €650,000 in the summer season and from $650,000 in the winter. Feed your inner thrill-seeker with a range of exhilarating water toys and towable inflatables offering endless entertainment as part of Bella Vita's (formerly Northern Star) stellar toy box. 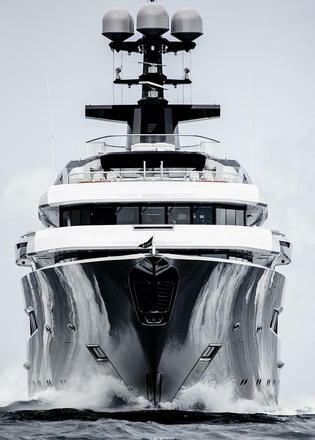 The 75.4 metre superyacht, which was delivered by Lürssen in 2009, boasts three Seabobs and two jet skis, as well as four kayaks (three one-person and one double) and three paddleboards for those who enjoy a slower pace on the water. Guests can also try their hand at wakeboarding or waterskiing, or explore the marine life below with a range of scuba diving and snorkelling equipment. Perfect for water babies, Bella Vita has two on-deck Jacuzzis for those in need of a dip, both of which are surrounded by sofas and loungers for relaxing in the sunshine. Inside, her recently refitted interior features a large main saloon with a grand piano and adjoining dining room, a beauty salon and massage room, an elegant skylounge with a bar and fireplace, a home cinema and a gym. She has accommodation for 12 guests in six cabins, including a stunning master suite complete with study, his and hers bathrooms and private bar. Bella Vita is managed for charter by Moran Yacht & Ship and has a weekly charter rate starting from €650,000 in the summer season and from $650,000 in the winter. Play in Caribbean waters atop one of Double Down's array of towables, or make waves with one of her jet skis. Children and adults alike can enjoy splashing into the ocean via her inflatable slide, while those after a calmer expedition can make use of a paddleboard. Double Down also has sailing and windsurfing facilities, so water babies will find it hard to run out of entertainment options. After antics in the sea, guests can unwind on deck with a cocktail in the Jacuzzi or on a sunlounger before dining in the shade at the al fresco dining table. 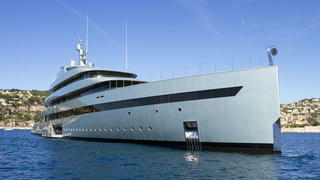 Codecasa delivered Double Down in 2010 and the 65 metre superyacht can sleep up to 12 guests in eight cabins. The fun continues below deck as she boasts karaoke equipment, a beautiful drinks bar, a gymnasium, an enormous main saloon and an elegant dining room for sumptuous evening feasts. Managed for charter by Thompson, Westwood & White Yachts, she has a weekly charter rate starting from €455,000 in the low season and €495,000 in the high season. Play in Caribbean waters atop one of Double Down's array of towables, or make waves with one of her jet skis. Children and adults alike can enjoy splashing into the ocean via her inflatable slide, while those after a calmer expedition can make use of a paddleboard. Double Down also has sailing and windsurfing facilities, so water babies will find it hard to run out of entertainment options. After antics in the sea, guests can unwind on deck with a cocktail in the Jacuzzi or on a sunlounger before dining in the shade at the al fresco dining table. Codecasa delivered Double Down in 2010 and the 65 metre superyacht can sleep up to 12 guests in eight cabins. The fun continues below deck as she boasts karaoke equipment, a beautiful drinks bar, a gymnasium, an enormous main saloon and an elegant dining room for sumptuous evening feasts. Managed for charter by Thompson, Westwood & White Yachts, she has a weekly charter rate starting from €455,000 in the low season and €495,000 in the high season. Spend your summer under clear skies frolicking in the sea with a Mediterranean vacation on board 46.7 metre Asya. Take your pick from her vast water toys collection, which includes a Seadoo, two SeaBobs, a Kawasaki Stand up jetski, a paddleboard, a knee board, two wake boards, two waterskis and a variety of inflatables. Delivered in 2015 by Heesen Yachts, her Bannenberg & Rowell interior features a welcoming main saloon complete with chaise lounges, sofas, dining table and library, and a movie lounge with a games table. On deck, there's a large Jacuzzi surrounded by sunpads with a cocktail bar nearby, lounge areas and al fresco dining tables. Asya is for charter with Ocean Independence and has a weekly summer rate starting from €240,000. Spend your summer under clear skies frolicking in the sea with a Mediterranean vacation on board 46.7 metre Asya. Take your pick from her vast water toys collection, which includes a Seadoo, two SeaBobs, a Kawasaki Stand up jetski, a paddleboard, a knee board, two wake boards, two waterskis and a variety of inflatables. Delivered in 2015 by Heesen Yachts, her Bannenberg & Rowell interior features a welcoming main saloon complete with chaise lounges, sofas, dining table and library, and a movie lounge with a games table. On deck, there's a large Jacuzzi surrounded by sunpads with a cocktail bar nearby, lounge areas and al fresco dining tables. Asya is for charter with Ocean Independence and has a weekly summer rate starting from €240,000. Which goes faster, a jet board, a quad ski, a jet-propelled kayak, or a jet ski? Find the answer by racing against family and friends, or opt for high speeds underwater with Senses' selection of Waverunners. The 59.2 metre superyacht also has plenty of other cool gadgets, such as ten paddleboards, two long boards, a laser, a jet lev, four kayaks with paddle or pedal optionality, a huge variety of inflatables, surfboards, dive equipment and kitesurfing gear. With all the fun that's to be had in the water, it will take Senses' amazing luxury offerings to lure you back on board. Delivered in 1999 by Freres Schweers Shipyard, her interior design is crisp and bright with accommodation for up to 12 guests in seven cabins. She features a dedicated massage and fitness room, a spacious main saloon with adjoining dining room, a TV lounge and a private office. On her capacious deck there's a vast al fresco dining table, a spa pool surrounded by white sunpads, a covered lounge area and a smaller breakfast table. Senses is available for charter with Y.CO and has a weekly rate starting from $325,000 — she will be spending the winter season in the South Pacific and Australasia. Which goes faster, a jet board, a quad ski, a jet-propelled kayak, or a jet ski? Find the answer by racing against family and friends, or opt for high speeds underwater with Senses' selection of Waverunners. The 59.2 metre superyacht also has plenty of other cool gadgets, such as ten paddleboards, two long boards, a laser, a jet lev, four kayaks with paddle or pedal optionality, a huge variety of inflatables, surfboards, dive equipment and kitesurfing gear. 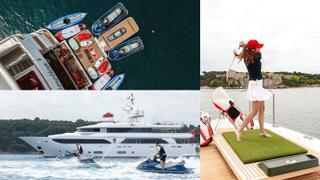 With all the fun that's to be had in the water, it will take Senses' amazing luxury offerings to lure you back on board. Delivered in 1999 by Freres Schweers Shipyard, her interior design is crisp and bright with accommodation for up to 12 guests in seven cabins. She features a dedicated massage and fitness room, a spacious main saloon with adjoining dining room, a TV lounge and a private office. On her capacious deck there's a vast al fresco dining table, a spa pool surrounded by white sunpads, a covered lounge area and a smaller breakfast table. Senses is available for charter with Y.CO and has a weekly rate starting from $325,000 — she will be spending the winter season in the South Pacific and Australasia. Zoom around O’Neiro’s iconic turquoise hull on one of her two F5 Seabobs or take a calmer circuit atop a stand up paddleboard or kneeboard. Ideal for families, she has a four-person water sofa, an inflatable jungle gym, water skis and scuba diving equipment for certified guests. After fun in the water, there are plenty of spots to relax on board this 52.7 metre vessel. 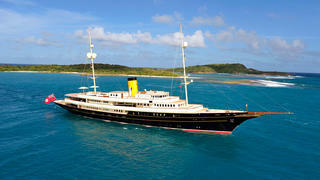 Delivered by Golden Yachts in 2008, she can sleep up to 12 guests in seven luxurious cabins. Her spacious main saloon is the perfect spot for catching up and playing games, while her formal dining area is great for a family feast. On deck there are a number of al fresco dining spots, a Jacuzzi and plenty of sunpads to fall asleep on in the sunshine. Managed for charter by Atalanta Golden Yachts, O’Neiro has a weekly charter rate starting from €155,000. Zoom around O’Neiro’s iconic turquoise hull on one of her two F5 Seabobs or take a calmer circuit atop a stand up paddleboard or kneeboard. Ideal for families, she has a four-person water sofa, an inflatable jungle gym, water skis and scuba diving equipment for certified guests. After fun in the water, there are plenty of spots to relax on board this 52.7 metre vessel. Delivered by Golden Yachts in 2008, she can sleep up to 12 guests in seven luxurious cabins. Her spacious main saloon is the perfect spot for catching up and playing games, while her formal dining area is great for a family feast. On deck there are a number of al fresco dining spots, a Jacuzzi and plenty of sunpads to fall asleep on in the sunshine. 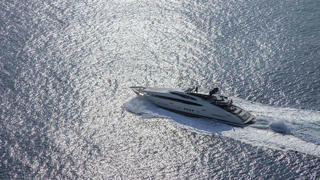 Managed for charter by Atalanta Golden Yachts, O’Neiro has a weekly charter rate starting from €155,000. With a completely updated toy box as of 2016, 50 metre _Trending _allows guests to peruse the ocean floor using the two-man glass-bottom kayaks, or simply paddle in the beach club pool that comes complete with a jellyfish net. More active guests can try their hand at kite surfing, water skiing, scuba diving or reef surfing, or for something a little more laid back, head out on a stand up paddle board, SeaDoo, SeaBob or one of the towable toys. Trending’s Donald Starkey interior features sleek and comfortable designs throughout. She has an elegant main saloon, a dedicated dining room and a lounge with a beautiful stone bar. Additionally, she can sleep up to 12 guests in six beautiful cabins. On deck, she has a large square Jacuzzi surrounded by sunpads, plenty of sunbeds, al fresco dining and a lounge area with a bar, perfect for watching the sunset with a cocktail. Managed for charter by Campers & Nicholsons, Trending has a weekly rate starting from $200,000 in the winter season and €210,000 in the summer. With a completely updated toy box as of 2016, 50 metre _Trending _allows guests to peruse the ocean floor using the two-man glass-bottom kayaks, or simply paddle in the beach club pool that comes complete with a jellyfish net. More active guests can try their hand at kite surfing, water skiing, scuba diving or reef surfing, or for something a little more laid back, head out on a stand up paddle board, SeaDoo, SeaBob or one of the towable toys. Trending’sDonald Starkey interior features sleek and comfortable designs throughout. She has an elegant main saloon, a dedicated dining room and a lounge with a beautiful stone bar. Additionally, she can sleep up to 12 guests in six beautiful cabins. On deck, she has a large square Jacuzzi surrounded by sunpads, plenty of sunbeds, al fresco dining and a lounge area with a bar, perfect for watching the sunset with a cocktail. Managed for charter by Campers & Nicholsons, Trending has a weekly rate starting from $200,000 in the winter season and €210,000 in the summer. Explore the world on board 95.2 metre Kismet and discover some of the most beautiful coral reefs using her state-of-the-art scuba diving gear. Failing that, gain a little speed closer to the surface on a Jet Ski, kayak, Seabob or Waverunner. The world renowned Lürssen superyacht was delivered in 2014 and can sleep up to 12 guests in eight cabins, which includes two master suites. Her stunning art deco interiors were created by Reymond Langton Design and feature a piano lounge and bar, multiple cocktail lounges, cinema room and formal dining room complete with fireplace. Additionally, she has a gym with stunning sea views and a spa that boasts a steam room, plunge pool, sauna, dedicated massage room and beauty salon. Guests have multiple options to relax on deck with a swimming pool, Jacuzzi, firepit surrounded by sofas, a beautiful al fresco dining table and a semi-shaded lounge that’s perfect for catching the last of the day’s sun. In the winter season, Kismet will be spending winter in the Caribbean with a weekly rate starting from $1,200,000 and she is managed for charter by Moran Yacht & Ship. 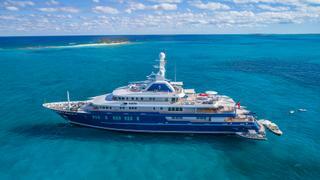 Her summer season will be in the Mediterranean, with a rater starting from €1,200,000. Explore the world on board 95.2 metre Kismet and discover some of the most beautiful coral reefs using her state-of-the-art scuba diving gear. Failing that, gain a little speed closer to the surface on a Jet Ski, kayak, Seabob or Waverunner. The world renowned Lürssen superyacht was delivered in 2014 and can sleep up to 12 guests in eight cabins, which includes two master suites. Her stunning art deco interiors were created by Reymond Langton Design and feature a piano lounge and bar, multiple cocktail lounges, cinema room and formal dining room complete with fireplace. Additionally, she has a gym with stunning sea views and a spa that boasts a steam room, plunge pool, sauna, dedicated massage room and beauty salon. Guests have multiple options to relax on deck with a swimming pool, Jacuzzi, firepit surrounded by sofas, a beautiful al fresco dining table and a semi-shaded lounge that’s perfect for catching the last of the day’s sun. In the winter season, Kismet will be spending winter in the Caribbean with a weekly rate starting from $1,200,000 and she is managed for charter by Moran Yacht & Ship. 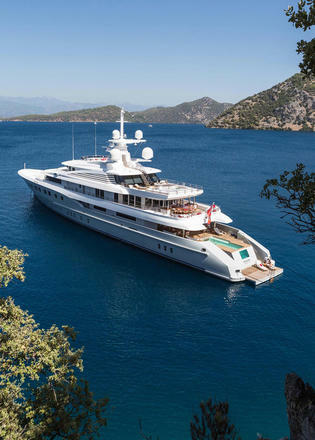 Her summer season will be in the Mediterranean, with a rater starting from €1,200,000. The regal Titania is the idea charter superyacht for families with young children who can’t get enough of being on the water. Her water toy list includes a multi-faceted inflatable water park and waterslide, stand up paddleboards, wakeboards, waterskis and towables, two Sea-Doo Waverunners, two SeaBobs and a stand-up jet ski. The 72 metre Lürssen luxury yacht has luxurious and traditional interiors that feature a beautiful main saloon complete with grand piano. Additionally, she has a private study, a formal dining room, an informal dining room with panoramic views, a gymnasium and a dedicated massage room. After a day on the water, guests can take a seat in the swimming pool or recline on one of the many sun loungers with a cocktail from the on-deck bar. She also boasts an al fresco formal dining table and a sizable beach club, which has loungers and a drinks bar. Managed for charter by Burgess, her winter weekly charter rate starts from $490,000 in the low season and $600,000 in the high season. During summer, her rate starts from €525,000 in the low season and €630,000 in the high season. The regal Titania is the idea charter superyacht for families with young children who can’t get enough of being on the water. Her water toy list includes a multi-faceted inflatable water park and waterslide, stand up paddleboards, wakeboards, waterskis and towables, two Sea-Doo Waverunners, two SeaBobs and a stand-up jet ski. The 72 metre Lürssen luxury yacht has luxurious and traditional interiors that feature a beautiful main saloon complete with grand piano. Additionally, she has a private study, a formal dining room, an informal dining room with panoramic views, a gymnasium and a dedicated massage room. After a day on the water, guests can take a seat in the swimming pool or recline on one of the many sun loungers with a cocktail from the on-deck bar. She also boasts an al fresco formal dining table and a sizable beach club, which has loungers and a drinks bar. Managed for charter by Burgess, her winter weekly charter rate starts from $490,000 in the low season and $600,000 in the high season. During summer, her rate starts from €525,000 in the low season and €630,000 in the high season. Axioma has some marvellous toys to offer guests, including an Aquaglide custom slide and an Ocean Pool. She also has as a range of inflatable pool toys such as a basketball set and football net, perfect for letting the kids have a paddle in the sea. Additionally, she boasts two inflatable sailing boats, water skis for adults and children, an eight-person banana boat, SeaBobs, a Waverunner, kayaks, paddleboards, diving equipment and a surfboard. Below deck, Axioma can sleep up to 12 guests in six cabins and features a mezzanine main saloon, formal dining room, cinema lounge, fully-equipped gym, massage room and steam room. Delivered in 2013 by Dunya Yachts, her extensive deck spaces include a pool, Jacuzzi with a swim-in bar, a number of al fresco dining spots and plenty of sunpads to catch those all-important rays. Axioma is managed for charter by YPI and has a weekly winter rate starting from €520,000 in the low season and €635,000 in the high season. During summer, her low season rate starts from €595,000 and from €635,000 in the high season. Axioma has some marvellous toys to offer guests, including an Aquaglide custom slide and an Ocean Pool. She also has as a range of inflatable pool toys such as a basketball set and football net, perfect for letting the kids have a paddle in the sea. Additionally, she boasts two inflatable sailing boats, water skis for adults and children, an eight-person banana boat, SeaBobs, a Waverunner, kayaks, paddleboards, diving equipment and a surfboard. Below deck, Axioma can sleep up to 12 guests in six cabins and features a mezzanine main saloon, formal dining room, cinema lounge, fully-equipped gym, massage room and steam room. Delivered in 2013 by Dunya Yachts, her extensive deck spaces include a pool, Jacuzzi with a swim-in bar, a number of al fresco dining spots and plenty of sunpads to catch those all-important rays. Axioma is managed for charter by YPI and has a weekly winter rate starting from €520,000 in the low season and €635,000 in the high season. During summer, her low season rate starts from €595,000 and from €635,000 in the high season. 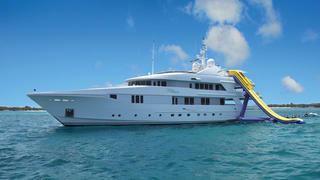 A vacation on board 46.94 metre Rhino will ensure that every guest will find their favourite way of enjoying the ocean. Bounce around on the water trampoline, pick up some speed atop the towables or have fun on the eight-person inflatable party island. While paddleboards and kayaks are perfect for exploring your surroundings, Waverunners, SeaBobs, wakeboards and water skis will keep those adrenalin junkies on board entertained. Rhino also boasts a barbeque, karaoke machine, Xbox with Kinect and four folding bicycles for on-land exploration. Additionally, her drone and six GoPro cameras will ensure that every moment of your trip is captured. Delivered by Admiral Marine in 1998, her outdoor spaces feature a Jacuzzi surrounded by shaded sunpads, a bar and a dining table. Relax below deck in the main saloon with drinks or unwind in the cinema with a movie. Rhino can sleep up to 10 guests in five welcoming cabins and also features a formal dining room for everyone to come together for a sumptuous evening feast. Managed for charter by Yachtzoo, she has a winter weekly charter rate starting from €140,000 in the low season and $150,000 in the high season. For summer charters, her weekly rate starts from $140,000 in the low season and $160,000 in the high season. A vacation on board 46.94 metre Rhino will ensure that every guest will find their favourite way of enjoying the ocean. Bounce around on the water trampoline, pick up some speed atop the towables or have fun on the eight-person inflatable party island. While paddleboards and kayaks are perfect for exploring your surroundings, Waverunners, SeaBobs, wakeboards and water skis will keep those adrenalin junkies on board entertained. Rhino also boasts a barbeque, karaoke machine, Xbox with Kinect and four folding bicycles for on-land exploration. Additionally, her drone and six GoPro cameras will ensure that every moment of your trip is captured. Delivered by Admiral Marine in 1998, her outdoor spaces feature a Jacuzzi surrounded by shaded sunpads, a bar and a dining table. Relax below deck in the main saloon with drinks or unwind in the cinema with a movie. Rhino can sleep up to 10 guests in five welcoming cabins and also features a formal dining room for everyone to come together for a sumptuous evening feast. Managed for charter by Yachtzoo, she has a winter weekly charter rate starting from €140,000 in the low season and $150,000 in the high season. For summer charters, her weekly rate starts from $140,000 in the low season and $160,000 in the high season. Last year, classically designed 90.1 metre superyacht Nero received four new Seadoos, a stand-up Jet Ski and two new SeaBobs. She also boasts a Flyboard, hoverboard, Aquaglide lounger, five-person Waterboggan, two canoes and a paddleboard, as well as a variety of inflatables. Twelve people can be accommodated in six elegant cabins. Her interior features a large main saloon, a lounge complete with fireplace, a light and airy dining room, TV lounge and a cocktail bar. Nero has traditionally styled deck space with plenty of seating, outdoor dining with optional shades, a vast rounded seating area, swimming pool, Jacuzzi and a pirate ship plank ideal for perfecting your dives. Burgess manages Nero for charter and she has a weekly rate starting from €525,000 in the summer season and $525,000 in the winter. Last year, classically designed 90.1 metre superyacht Nero received four new Seadoos, a stand-up Jet Ski and two new SeaBobs. She also boasts a Flyboard, hoverboard, Aquaglide lounger, five-person Waterboggan, two canoes and a paddleboard, as well as a variety of inflatables. Twelve people can be accommodated in six elegant cabins. Her interior features a large main saloon, a lounge complete with fireplace, a light and airy dining room, TV lounge and a cocktail bar. Nero has traditionally styled deck space with plenty of seating, outdoor dining with optional shades, a vast rounded seating area, swimming pool, Jacuzzi and a pirate ship plank ideal for perfecting your dives. Burgess manages Nero for charter and she has a weekly rate starting from €525,000 in the summer season and $525,000 in the winter. Stay active on board luxury yacht W, who was delivered by Westport in 2013. 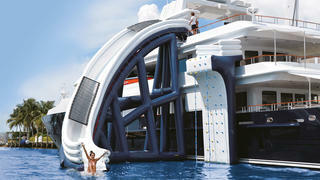 The 39.6 metre superyacht has an inflatable slide and climbing wall so you can practise your skills. Additionally, she has two jet skis, four paddleboards, two SeaBobs, a range of towables and a two-person pedal kayak. Up to 10 guests can stay in five cabins and relax in the beautiful main saloon in front of a movie or enjoy an incredible meal in the dining area. Her sundeck has a Jacuzzi surrounded by sunpads as well as a dining table and bar, with another al fresco option and cocktail bar on the deck below. 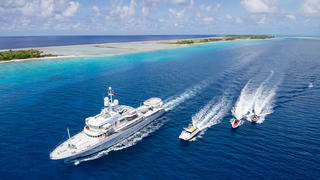 Managed for charter by Churchill Yachts, W has a weekly rate starting from $125,000. Stay active on board luxury yacht W, who was delivered by Westport in 2013. 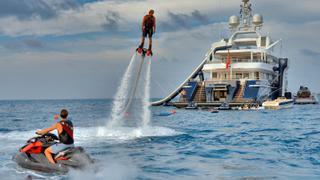 The 39.6 metre superyacht has an inflatable slide and climbing wall so you can practise your skills. Additionally, she has two jet skis, four paddleboards, two SeaBobs, a range of towables and a two-person pedal kayak. Up to 10 guests can stay in five cabins and relax in the beautiful main saloon in front of a movie or enjoy an incredible meal in the dining area. Her sundeck has a Jacuzzi surrounded by sunpads as well as a dining table and bar, with another al fresco option and cocktail bar on the deck below. 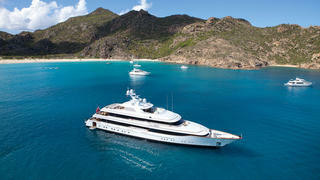 Managed for charter by Churchill Yachts, W has a weekly rate starting from $125,000. Go on an adventure beneath the surface of the South Pacific using 45.7 metre Vantage’s three-man Triton submarine. She also has a towable banana boat, couch and doughnut, was well as a SeaBob, two paddleboards, a wakeboard, surfboards, body boards, two kayaks and an extra large water mat. Delivered in 2010 and refitted in 2016, Vantage can host up to 12 guests in five cabins, which includes a full-beam master suite. She also has a spacious main saloon and dining area, as well as a private study with views out to sea. On the flybridge she has a circular Jacuzzi, sunpads and a seating area where you can enjoy a cocktail from the nearby bar and discuss your sub-marine findings. 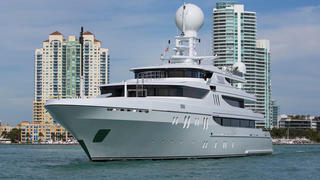 Vantage is available for charter with Ocean Independence and has a weekly rate starting from $192,500. Go on an adventure beneath the surface of the South Pacific using 45.7 metre Vantage’s three-man Triton submarine. She also has a towable banana boat, couch and doughnut, was well as a SeaBob, two paddleboards, a wakeboard, surfboards, body boards, two kayaks and an extra large water mat. Delivered in 2010 and refitted in 2016, Vantage can host up to 12 guests in five cabins, which includes a full-beam master suite. She also has a spacious main saloon and dining area, as well as a private study with views out to sea. On the flybridge she has a circular Jacuzzi, sunpads and a seating area where you can enjoy a cocktail from the nearby bar and discuss your sub-marine findings. Vantage is available for charter with Ocean Independence and has a weekly rate starting from $192,500. Lady Britt has a huge array of water toys, which includes a collection of inflatables such as the Aqua Glide Swinstep, Fiesta, Runway, Inversible and Jungle Gym, as well two beach pavilions. If you’re more inclined towards sports, make use of the sailing dinghies, waverunners, kayaks, windsurfers, inflatable paddleboards, water skis, wakeboards, SeaBobs and kneeboard. The 63 metre Lady Britt was delivered in 2011 by Feadship, can sleep up to 12 guests in seven cabins and has beautiful interiors designed by Redman Whiteley Dixon. She has a dining room, TV lounge, a vast main saloon, private study, an elegant bar area, a gym and a state of the art spa, complete with authentic Finnish sauna. On deck, there’s a cosy al fresco cinema, a large Jacuzzi surround by sunpads and plenty of dining spots suitable for a glamorous brunch in the sunshine or evening cocktails in the moonlight. Lady Britt is managed for charter by Edmiston and has a winter weekly rate starting from $445,000 in the low season and $470,000 in the high season. Her summer weekly rate starts from €445,000 in the low season and €470,000 in the high season. Lady Britt has a huge array of water toys, which includes a collection of inflatables such as the Aqua Glide Swinstep, Fiesta, Runway, Inversible and Jungle Gym, as well two beach pavilions. If you’re more inclined towards sports, make use of the sailing dinghies, waverunners, kayaks, windsurfers, inflatable paddleboards, water skis, wakeboards, SeaBobs and kneeboard. The 63 metre Lady Britt was delivered in 2011 by Feadship, can sleep up to 12 guests in seven cabins and has beautiful interiors designed by Redman Whiteley Dixon. She has a dining room, TV lounge, a vast main saloon, private study, an elegant bar area, a gym and a state of the art spa, complete with authentic Finnish sauna. On deck, there’s a cosy al fresco cinema, a large Jacuzzi surround by sunpads and plenty of dining spots suitable for a glamorous brunch in the sunshine or evening cocktails in the moonlight. Lady Britt is managed for charter by Edmiston and has a winter weekly rate starting from $445,000 in the low season and $470,000 in the high season. Her summer weekly rate starts from €445,000 in the low season and €470,000 in the high season. Illusion V offers the perfect blend of laidback ocean cruising, thanks to her kayaks, SUP paddleboards and Aqua Gilde Airport Lounge, and exciting water sports, thanks to her SeaBobs, Jet Skis, wakeboard, Skurfboard and water skis. She also has a six metre inflatable slide and a kids’ inflatable pyramid. She was delivered in 2014 by Benetti and features an airy and light sundeck dining room and an opulent stone Jacuzzi surrounded by sunpads, which is conveniently close to the outside bar and lounge area. Below deck, she has a chic main saloon, cinema room, multiple cocktail bars, gym equipment and a wine cellar to ensure that everyone has their favourite tipple on board. Managed for charter by Camper & Nicholson’s, 58 metre Illusion V has a weekly rate starting from €350,000 in the summer and $350,000 in the winter. Illusion V offers the perfect blend of laidback ocean cruising, thanks to her kayaks, SUP paddleboards and Aqua Gilde Airport Lounge, and exciting water sports, thanks to her SeaBobs, Jet Skis, wakeboard, Skurfboard and water skis. She also has a six metre inflatable slide and a kids’ inflatable pyramid. She was delivered in 2014 by Benetti and features an airy and light sundeck dining room and an opulent stone Jacuzzi surrounded by sunpads, which is conveniently close to the outside bar and lounge area. Below deck, she has a chic main saloon, cinema room, multiple cocktail bars, gym equipment and a wine cellar to ensure that everyone has their favourite tipple on board. Managed for charter by Camper & Nicholson’s, 58 metre Illusion V has a weekly rate starting from €350,000 in the summer and $350,000 in the winter.